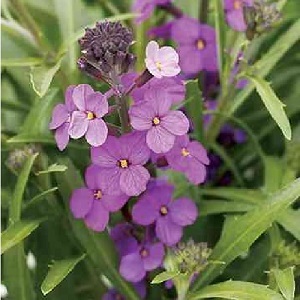 A showy and unusual form of Wallflower with lilac coloured flowers in early summer, from May to June. Plants grow to about 30cm in height and are good for borders, containers and gravel gardens. These Wallflowers are more compact than traditional Wallflowers and flower later, in early summer. These plants grow best in full sun and neutral to alkaline well drained soil. These are short-lived perennials and if you leave some seed on the plant after flowering they will re-seed naturally in your garden. Pack of approx 100 seeds. Sow indoors in winter or early spring for same season flowers in late summer. Or sow in summer/autumn for next year flowers, either indoors or directly in the ground. 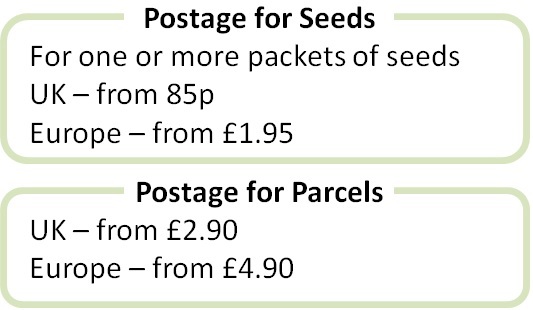 Sowing instructions are and a colour photo are printed on the packet. Sow indoors in winter and early spring for same year flowers in autumn. Sow the seeds into a tray of compost, cover lightly with compost, keep at around 20°C and germination takes 1-3 weeks. Plant seedlings into pots when they are big enough to handle, and then plant out into the ground or containers after hardening off. Or sow seeds in summer/autumn either indoors or directly into cultivated ground, and plants flower the following spring. Grow Deadhead plants during flowering to encourage repeat flowering. Trim back plants after flowering to keep a more compact shape. Semi-ripe cuttings can be done in summer.